The second oldest manmade object in New York City — outside, that is, not in a museum or private collection — is a solitary little Roman column built in 120 AD for the Temple of Artemis in the ancient city of Jerash. It once stood among a chorus of ‘whispering columns’, creating an effect in the temple which would magnify the human voice. 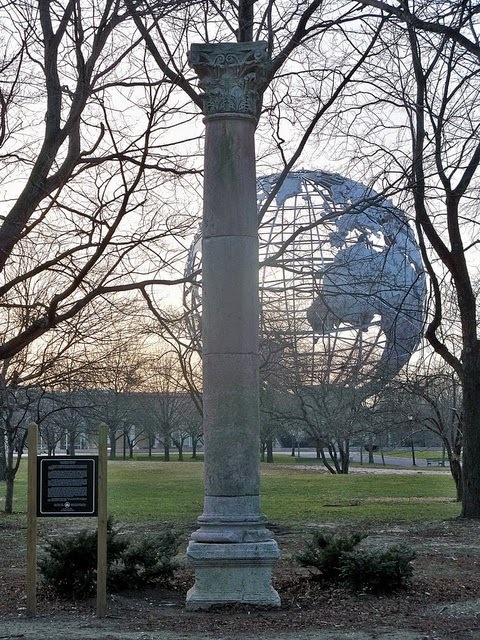 So why is it standing all alone in Flushing Meadows Park in Queens? 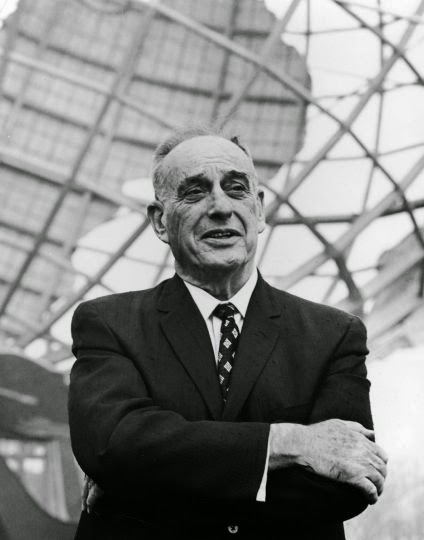 It was a gift of the Kingdom of Jordan for the New York World’s Fair of 1964-65, presented on April 22, 1964, by the young King Hussein to none other than Robert Moses. What did those two have to talk about? 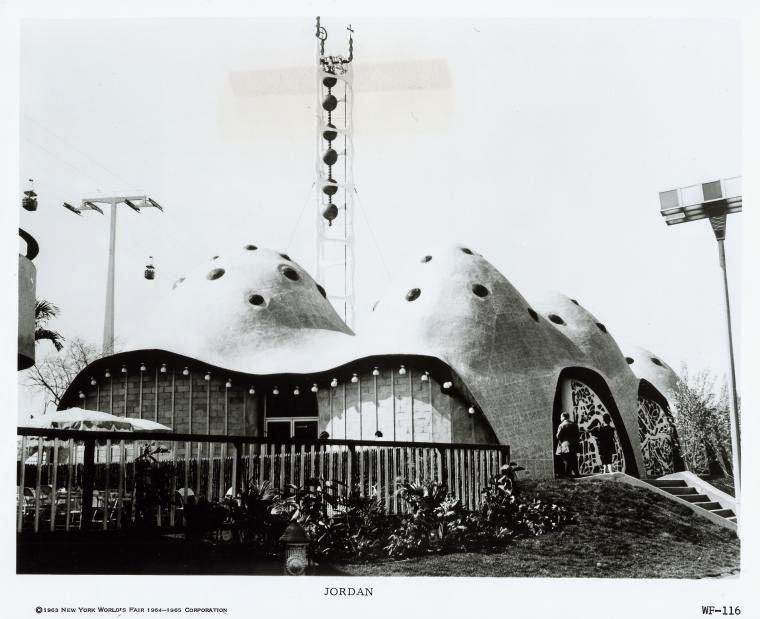 The Jordanian Pavilion at the World’s Fair was a particularly unusual addition to the unofficial (and incomplete) league of nations at the fair. Despite its almost alien appearance — curved and encrusted with gold mosaics — it was one of the most religious buildings there, embodying imagery of both the Christian and Muslim faiths. Sculptural displays of Stations of the Cross by Antonio Saura decorated the exterior, and bright stained glass windows lit up spectacularly at night. The Dead Sea Scrolls were displayed alongside a replica of the Dome of the Rock, and visitors could shop at a jewelry bazaar or eat traditional Middle Eastern food in the snack shop. But despite the many artifacts of great historical provenance, the most controversial thing in this odd building were a set of newly painted murals. Some Jewish visitors to the pavilion were immediately offended by one particular mural depicting a young refugee expounding in a lengthy text about the Israeli-Palestinian situation at the Jordanian border. “The strangers, once thought terror’s victims, became terror’s practitioners,” it said, implicating the Israelis (but never mentioning them by name). 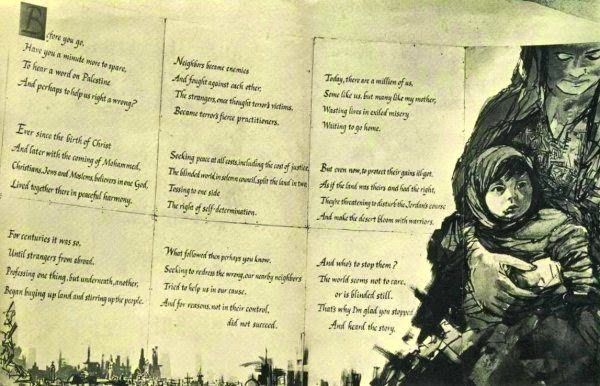 Organizers at the American-Israeli Pavilion wrote Moses to complain, saying the murals were not in keeping with the fair’s theme of “Peace Through Understanding.” Moses (pictured below) initially rejected the request, but Mayor Robert Wagner, perhaps in an intentional slight to the former parks commissioner, promised to have the murals removed. Members of the City Council even proposed a bill forcing the fair to remove the mural. The Jordanians replied that they would rather close the pavilion than tear down the murals under pressure. Israeli protesters picketed the pavilion; at one point, the Jordanian flag was taken and temporarily replaced by the Israeli flag by a protester. Of course, as a result, the Jordanian Pavilion became hugely popular in the early days of the fair, with thousands of visitors streaming in to see what the fuss was about. The Isaeli pavilion then unveiled its own mural as a response to the Jordanian mural. Further lawsuits, even fistfights, ensued over the controversy. In the end, none of the murals were removed. What got sadly overshadowed in all this, of course, was the Column of Jerash, which could have been made of plaster for all the attention it received. THIS COLUMN WAS PRESENTED TO/ THE NEW YORK WORLDS FAIR AND THE CITY OF NEW YORK BY/ HIS MAJESTY KING HUSSEIN / OF THE HASHEMITE KINGDOM OF JORDAN/ ON THE OCCASION / OF JORDAN’S PARTICIPATION IN THE FAIR./ THE COLUMN WAS RECEIVED BY THE HONORABLE ROBERT MOSES, PRESIDENT, / NEW YORK WORLD’S FAIR 1964-1965 CORPORATION./ THIS IS ONE OF MANY COLUMNS IN A TEMPLE ERECTED BY THE ROMANS/IN 120 A.D./ THAT STOOD IN THE ROMAN CITY OF JERASH, JORDAN./ THE COLUMNS ARE KNOWN AS THE WHISPERING COLUMNS OF JERASH. Okay, so that’s the second oldest large manmade object in New York City? What’s the oldest? That’s the subject of our new podcast tomorrow so stay tuned!